Chad Morris put together his third recruiting class last week, another one chock full of Texans. As Morris' rebuild on the Hilltop continues, let's look at SMU's recruiting over the past five years. If you look at SMU's 24/7 composite rankings over the past five years, you'll see that SMU has been nothing if not consistent. From June Jones last two classes, when we assume he was just sending out offers blindly, to Morris' first three classes, the Mustangs have ranked somewhere between 81st and 71st. If you look at SMU's average player rating, there has been a slight up tick in rating, but it is ever so slight. From a national ranking perspective, if a Group of Five team can fall into the top 70, that's good. This cycle 6 G5 teams were in the top 70. Mountain West power Boise State consistently ranks first in league in recruiting, with an average class ranking of 65. That translates to 75% win percentage. San Diego State has an average national ranking of 76 in the last five years. They've won 69% of their games including back to back eleven win seasons. In CUSA Marshall has a composite average of 67 over the last five years, easily the best in league. In that time the Herd have won 36 and lost 17, a 68% win percentage even factoring in a three win 2016 campaign. 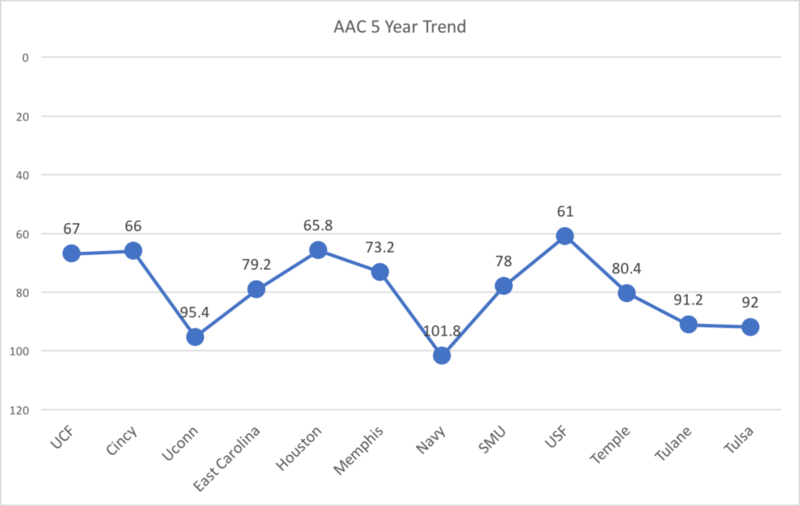 In the AAC the correlation plays out fairly well. Houston with an average rating of 65.8, second best in the AAC, leads in win percentage at almost 70% in conference over last four years. USF, with the best five year rating is tied for third in conference wins in that same time period. Cincinnati and UCF are both in the top four in 5 year class average and are tied for 3rd and 2nd respectively in conference wins the last four years. Bottom line, if you recruit well, you're going to sit in the top three or four in conference wins. Well, unless you're Temple, which we can only chalk up to great coaching. If you can get into that magical 60 to 70 range or better, you've made quite the headway if you're a G5 school. SMU is still endeavoring to get there. This season they fell back into the 80s. There is a trickle down effect in recruiting. This season was the prime example of Reagan era economics in collegiate recruiting. This season a greater than average number of the Texas top 25 left the state. Of the top 10 Texas prep players, only two stayed in state. Just six of the top 25 signed with Texas colleges. That historically low number that was caused by a couple things, first the University of Texas' struggles and second Baylor's regime change. That paved a highway into the state for the SEC, Big 10 and ACC to have great success than ever in the state. As a result, Texas and Baylor weren't poaching from the top 25, they were poaching from classes like SMU's and Houston's. Players like Charlie and Cade Brewer who were SMU commits, even late into the process flipped. All told SMU had seven 3-star or better recruits flipped over the course of the last six months, most to Power 5s. Losses like that dropped SMU's class from what could have been the best in recent history to just another class in the 80s. SMU has surprisingly been fairly successful in accumulating 3-star talent or great. Other than a dip in 2014, the Mustangs have signed classes with half or more 3-star talent. This season the Mustangs took a slight dip, but again, some of that can be attributed to late defections. There's good news and bad news for SMU based on its five year cycle. The good news is the Mustangs are consistently bringing in top heavy classes. In the last two seasons 60% of SMU recruits have been 3-star rated. The other good news is that the Mustangs are getting closer to breaking through with a top 70 class. They need to close some of these late flips. Maybe an early signing period in December helps with that. The bad news is that the Mustangs, in spite of everything Morris has done on the Hilltop, are still recruiting in a ratings range not unlike what June Jones and Co. were doing. Posted on February 6, 2017 by The Roundup and filed under Southwest Round-Up, SMU and tagged SMU AAC Chad Morris June Jones.